Here’s a quick sketch of Ellie’s Orbital Platform, or O.P. for short. But the crew here at Mission Control just call our bus-sized satellite Opie. 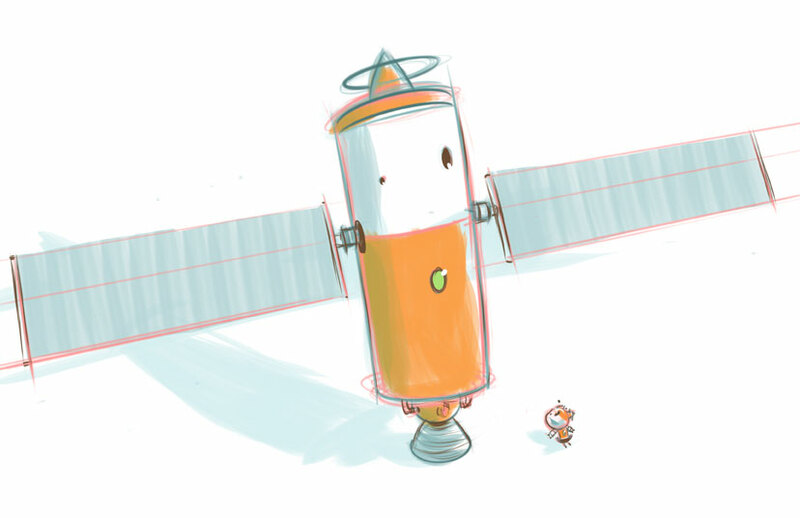 He doesn’t say much, but he’s got the important job of relaying signals back and forth between Ellie and Earth, as well as forecasting weather, guiding Ellie on the safest path (though she doesn’t always take it), and taking fantastic high detail photos of the planet’s surface. You can see him represented in the Mission Control hologram map of Planet X in this pic here. So awesome, love your designs Jim. It looks like Opie’s got a reset button, too! Y’know, I’m not sure Muffin is going to be able to throw a rock that far…. Boy, he’s a big fella! Jim, I love his little ‘hat’! I hope to see more of him. I wonder if he philosophizes from his orbit about the vastness and loneliness of outer space? Thanks, Rich. There’s many a big guy who may not seem to be on the outside, but on the inside are really sensitive inward looking fellas that contemplate life’s meaning in the cosmos.